SealSkinz have revamped a classic promoting weather protecting agents whilst maintaining high levels of breathability. 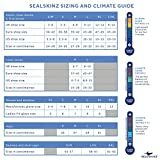 The SealSkinz Waterprook Cap contains a raft of attributes implemented to deter inclement conditions. Totally waterproof, the glove works to prevent water ingress whilst simultaneously providing excellent windproofing. All done whilst remaining highly breathable, the Cap generates a comfortable and dry environment. Subsidiary features attached to Cap include a stiff peak, dispensed to protect visibility, keeping both rain and sun out of the wearers eyesight. A rear size adjuster and mesh lined interior allows the hat to conform a shape required by wearer, working to provide a comfortable fit. Completed with a UPF 40+ rating, ensures excellent sun protection is provided. Aqua Dynamic Design Breathable Breathability affords the wearer with a comfortable, drier environment. Through the process of allowing moisture to escape, skin remains drier for longer. Durable Highly durable fibres ensure a product built to last. The Cap is able to withstand adverse pressure, wear and damage. Flexible SealSkinz have incorporated 'flex' into the design, enabling the Cap to remain pliable without sacrificing fit. Waterproof SealSkinz products are developed to produce 100% waterproof protection without sacrificing breathability. Windproof Prevents wind from protruding through the exterior. Lightweight and breathable, providing protection from the elements with excellent dexterity and control.